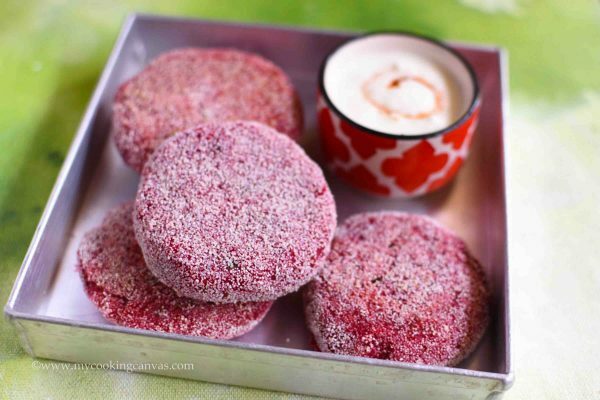 Beetroot Cutlet is the last-minute snack that you can plan for a celebration or for your Dinner party.A dish which is undoubtedly a crowd-pleaser. The twist here I gave to Beetroot Cutlet is adding bhut-jolokia sauce. The sweetness of beetroot and the hotness of bhut-jolokia compliment each other so well.These Beetroot cutlets are so addictive that you won’t be satisfied with one piece. You can try this Bhut-jolokia sauce by Sprig. Blended with some spices ,SPRIG has made one of the best chilli sauces ever.The legendary ‘Ghost Pepper’, one of the hottest chillies in the world, stars in this hot sauce. In fact, I am just adding a drop of it to tomato sauce to make a spicy dip for pakodas. Everyone in family loving this.If you are still scared to try this, I would say just take a chance.Go for it …. One more thing I like about Beetroot Cutlet is the vibrant natural color. And it looks so tempting that kids will surely love it. you can add some raisins or cashew to it. Also, use them as patty to make a healthy burger. Do You know Amazing Health Benefits of Eating Beets? It’s a Superfood which works magically to improve red blood cell count as it is high in folic acid as well as iron, potassium. It lowers blood pressure.It contains antioxidants, which may help lower glucose levels, increase insulin sensitivity. it has high fiber content, beetroot helps to prevent constipation and improves digestion. These are the amazing facts of this earthy vegetable. The overpoweringly vibrant red can change any dish attractive.Try this recipe of beetroot cutlet to believe my words.Happy Cooking guys. Boil potato and beet-root till they are just done or you can pressure cook them together up to two whistles. Let it cool and grate them in a bowl. Add grated ginger and all other ingredients except bread and semolina. Now tear the bread and make a powder kind. Add this to beet-root mixture. Make 7 to 8 equal sized patty. Spread semolina on a plate. Take one patty and place on it .Each patty should be coated evenly with semolina. Heat a pan and sprinkle a little oil. Now slow fry the tikki at medium heat. It will take 3 to 4 minute for each Croquette to be ready. Serve hot with your favorite dip.